The Living Pantry is a client-choice, personal shopping, food and personal care pantry, providing fresh foods including meat, poultry, fruits, vegetables, and dairy products, along with non-perishable food, personal care items and nutrition education, for those living with HIV/AIDS and their families and/or significant others. The goal of the Living Pantry is to assist people living with HIV/Aids access to the best nutrition, develop healthy eating habits, and live healthier lives. The Living Pantry is the only food and personal care item pantry in the region that seeks to meet the specific nutrition needs of people living with HIV/AIDS. It is also the only pantry that provides fresh foods and a nutritionist offering assessments, education, and counseling to pantry recipients. A nutritionist, funded by the USDA SNAP program, offers education regarding choosing healthful diets for our pantry recipients. With our nutritionist acting as a personal shopper, our clients learn, on the spot, which foods are best for them, given their medical condition. We are the only pantry to offer this service. Other Living Pantry services include food delivery, emotional support, and financial assistance to meet daily basic needs not covered by other agencies and coordination and service linkage with other service providers in the region. The Living Pantry provides bi-weekly food pick up (with extended service hours) and delivery services. The Living Pantry was started in 1995 to meet the special needs of those living with HIV/AIDS. HIV is a debilitating virus that can interrupt the body’s ability to fight off life-threatening disease. Research has shown that eating a healthy diet can lessen the impact of the disease. 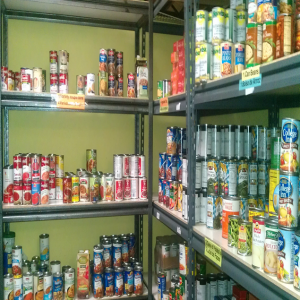 The food pantry provides both nutritious food and assistance to clients to help them use their food resources, such as food stamps, most effectively. Personal care items, not covered by food stamps, were later added to the pantry to improve the health and quality of life of our clients. These include toilet paper, soap, shampoo, and other personal hygiene products. Personal care items, toothpaste, soap, shampoo, toilet paper, etc.